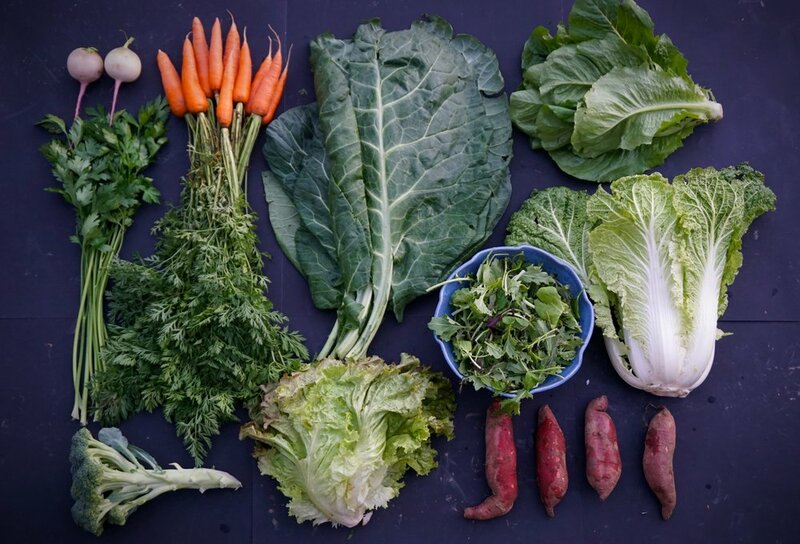 So much harvest it's hard to fit it all in the frame (clockwise from top left): watermelon radish, carrots, collards, Romaine lettuce, Napa cabbage, baby Asian salad mix, sweet potatoes, red leaf lettuce, broccoli, flat leaf parsley. Welcome to Week 7 of the 2017 Fall and Winter share season. This week marks the beginning of the second half of the Fall CSA, and we are excited to bring you the next 6 weeks of veggies! On Thanksgiving Week ONLY (next week) all CSA shares will be distributed on Tuesday. Home deliveries will go out on Tuesday as well! If you are an every-other week share and don't pick up on Thanksgiving week, we will have extra veggies for sale in the farm stand. Last week was a busy week! Aside from all of the normal CSA harvest, wash, pack and farm work, I had the opportunity to lobby in Washington, D.C., on behalf of small farmers. Our family also had a trip to St. Jude for Magnolia’s scheduled six-month scans. I was flown to D.C. by the national Sustainable Agriculture Coalition as part of their "farmer fly in" with the mission of promoting legislation aimed at increasing local food production and the federal conservation programs that many small farms such as ours use to implement sustainable agricultural practices. While I was only in D.C. for about 36 hours I had numerous meetings, including one with House Representative Trent Kelley and one with staffers (including my cousin Bennet Mize) from the office of a Senator Thad Cochran. The trip was a whirlwind! I was surrounded by national experts on agricultural policy and an incredible group of 16 other farmers and plant breeders from across the United States and felt incredibly fortunate to have my voice heard by politicians from Mississippi and across the country. After the trip from D.C., I flew into Memphis and took a cab to St. Jude to meet Amanda and the girls to finish the last of Magnolia’s scans and meet with her oncologist. We got great news from St. Jude: Mag Pie remains cancer free. Then we headed back home to pick up the dogs and get back to life on the farm! As many of you may know, I believe that local, sustainable food production has the power to transform the economy, health and culture of Mississippi, while I am a firm believer in creating change through grassroots action, the trip to DC reminded me of the important role that federal policy has to play in shaping the food systems of our nation. As always, I am thankful to Amanda, our wonderful farm crew and our supportive CSA members for helping to keep this mission alive, well and growing. And, finally, local artist AND one of our fall farmers, Lujan Perez was hit by a car while biking down West Jackson St. last Tuesday night. She was released from the hospital with several broken bones on Friday night. We wish her a swift recovery and ask you to keep her in your thoughts.